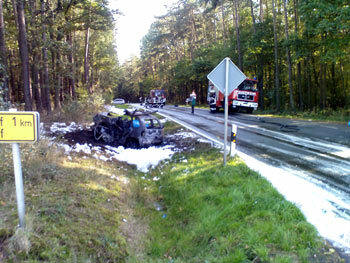 On sunday, 09/30/2007 at 12:55 p m the fire departments of Nittenau and Bergham were called for a severe motor vehicle accident with extrication from a burning car between Nittenau and Kaspeltshub. When the first units of these two fire departments arrived at the scene, the VFD Steinberg was already there. 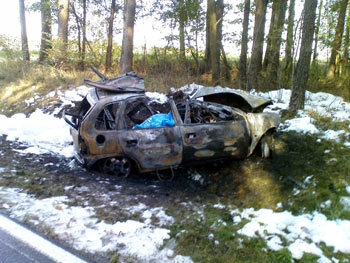 After a frontal crash, two cars were completely on fire. The two passengers of one car could free themselves, the young female driver of the other one (an Opel Corsa), was trapped inside her burning car, for her each assistance came too late. First aiders could rescue a dog from the burning car, but it had to be put down by a veterinary due to its severe injuries. 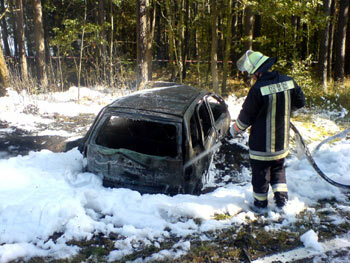 The fire departments of Nittenau and Bergham extinguished the fires with foam and later extricated the burnt body.